It has been almost two weeks since the text message that said “Gray Kingbird Viera Wetlands.” The person who sent the text was the same person who sent the text message that had sent me running after a Grace’s Warbler less than a month earlier. How does a single birder manage to make me drop everything two times in one month, in incidents separated by over a thousand miles? When the birder is Doug Gochfeld and he has a lifer on tap for me I have no option but to get out the door on a twitch! What the heck am I talking about? Well, when I got the text I had just returned to my hotel room in Titusville, Florida, after a full morning birding Merritt Island National Wildlife Refuge during the Space Coast Birding and Wildlife Festival. My plan was to recharge and rest and then get to the Viera Wetlands for the evening light. Instead, almost as soon as I put down my backpack my cell phone buzzed and I was out the door, in my car, and on I-95 before my brain even had time to process what I was doing. In retrospect, my haste was likely unwarranted. The bird was peaceably flycatching when I arrived after my 25-minute drive, and was in no rush to go anywhere. 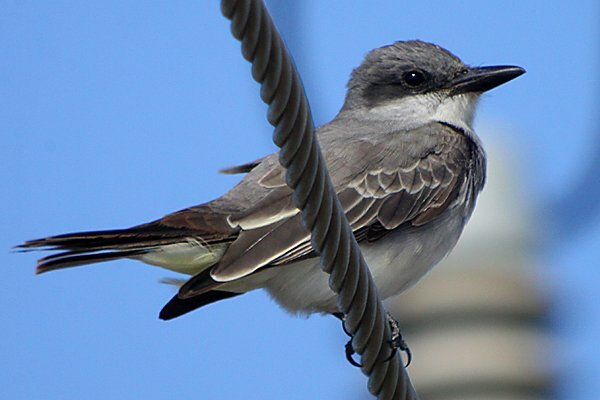 I guess my knowledge of recent New York sightings of Gray Kingbird influenced my pedal-to-the-metal approach – the last two birds that I know of that showed up in New York were in sight for a matter of minutes before disappearing for good. 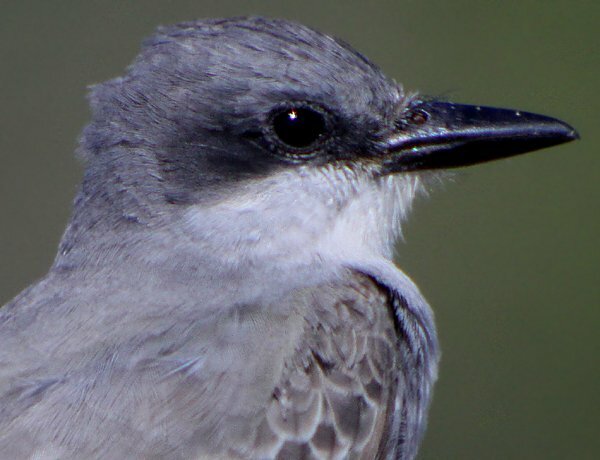 If I had thought to stop I might have realized that Gray Kingbirds in Florida are much less likely to be five-minute wonders. They do breed in Florida, after all, even if they are exceedingly rare in winter. Doug had been driving out of the Viera Wetlands and stopped to try to get some shots of what he thought was a Loggerhead Shrike on the wires. Was he ever surprised when he actually got glass on the bird! He got some shots, clinched the identification, and sent out some texts. Only Doug, who is essentially a rarity magnet, could find a rarity in a heavily birded spot that hosts scores of birders every day in winter. Not that I am complaining at all because this was a life bird that wasn’t even on my radar for my trip to Florida! Anyway, I enjoyed watching and digiscoping my lifer Tyrannus dominicensis flycatching from the overhead wires and downing its prey. 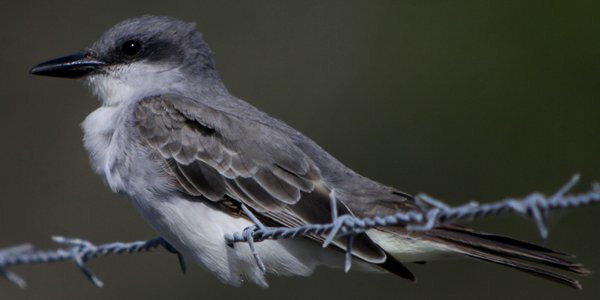 Such a big-billed kingbird is cool, and the shrike-like mask only adds to the appeal. 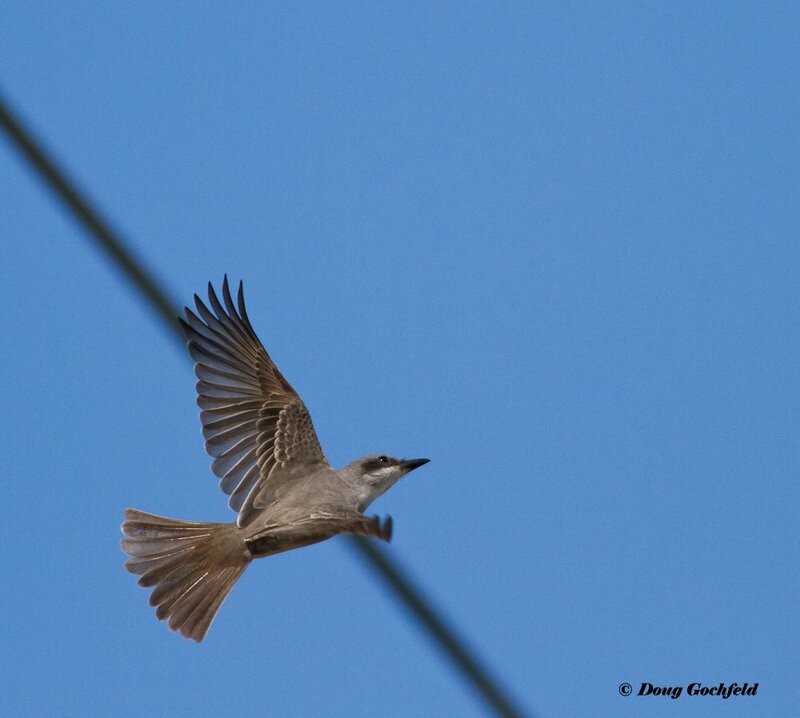 Doug was kind enough to share the flight shots below and explain how he aged the bird as a young male. 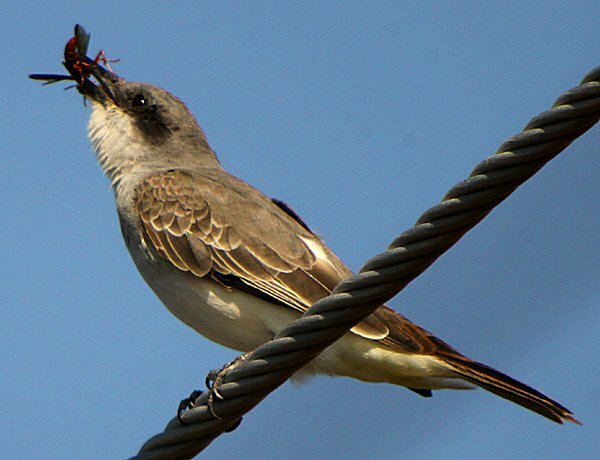 In Eastern Kingbirds, the more notched the tips of the outer primaries are, the more adulty and the more manly it is. These notches are called emarginations. A bird with extremely emarginated outer primaries is an adult male, while a young female shows very blunt-tipped primaries with no noticeable emarginations. In between are first-winter male and adult female. 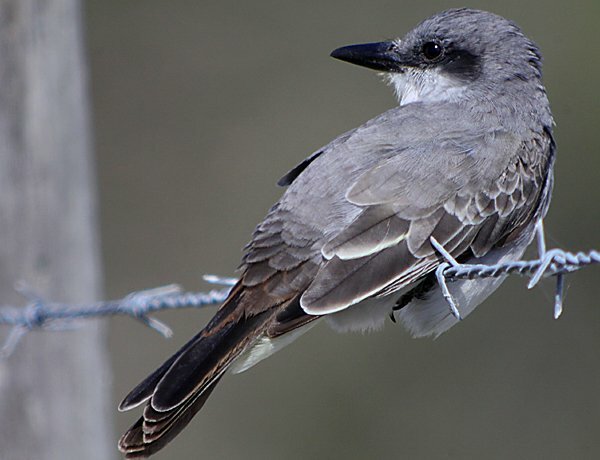 This Gray Kingbird individual has noticeable, but not super deep emarginations, apparently placing it somewhere between adult male and first-winter female. Luckily, we can see that this individual has a molt-limit visible in the coverts, hence it is a first-cycle/winter bird (SY, at this point). 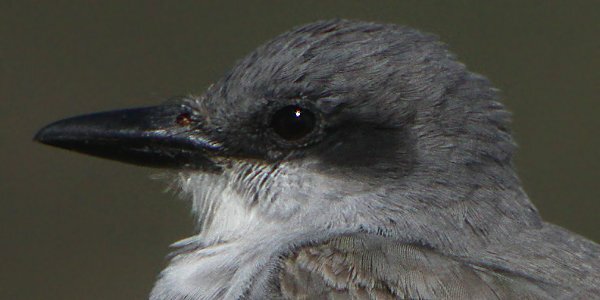 Therefore, we can eliminate adult female, and hypothesize that this guy (which we can now call “him”) is a first-winter/first-cycle/second-year (all three of those mean the same thing for this bird right now) male Gray Kingbird. Now that your head hurts I will simply share some more shots of one of my most recent additions to my life list with the hope that I can prevent you from running screaming from this blog never to return again. What a great bird! Thanks to Doug for both finding it and for his pictures! Occasionally, you forget to hide that you are not a really serious birder after all. “Recharge and rest” – what a ridiculous concept on a birding trip to Florida! 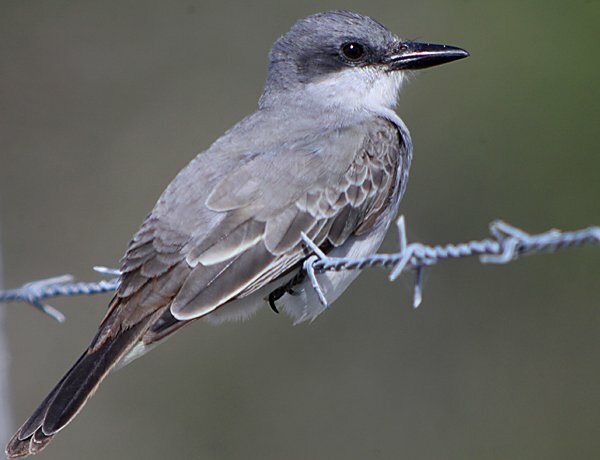 Gray Kingbird. 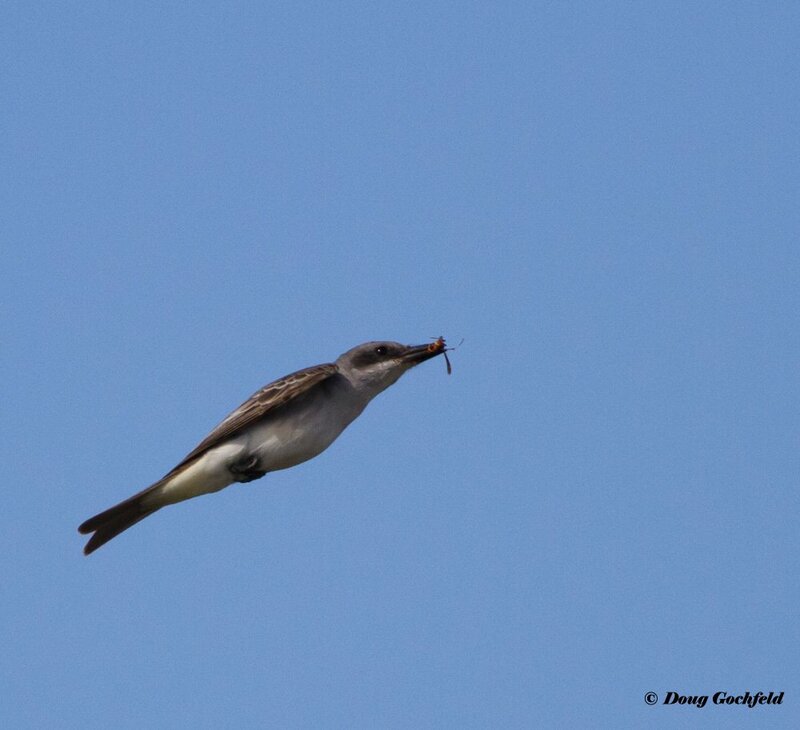 That is a bird I need to see…the last breeding flycatcher north of Mexico that I have not laid eyes on. Awesome photos. You know .. even now I drive like a wildman to grab a life bird ! I was at Viera this morning after reading about others viewing the kindbird on Friday and Saturday.. today was wet with a stiff wind … but I found two nesting pairs… I would’ve been happy with one ! So yes they r still here … and I photographed them on nest from a great distance … thank God for zooms! @Seagull Steve: Yes you do. Yes you do. 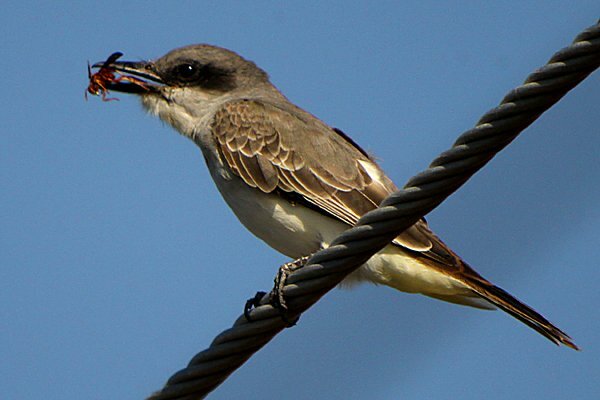 @kindbird: No worries – when Doug first found the kingbird he had pulled over hoping to get some shots of what he thought was a shrike perched on the wire. Was he ever surprised to realize that it wasn’t a shrike!